Let's be honest - no one likes an itchy, flaky scalp. I hate it, I'm sure you hate it, but it can be a pain to fix. This seems to be particularly true if you prefer to avoid certain ingredients in your haircare, such as silicones or SLS. Most mainstream and popular options contain them and for some of us that can cause more bad than it can good. I've had the issue of an itchy, flaky scalp over the last year or so, and I've (rather literally) been scratching my head wondering if I'll ever find the perfect solution that works best for me. Today I'm going to be writing about a product that I feel is worth giving a thorough discussion about: the Philip Kingsley Flaky/Itchy Scalp Shampoo. 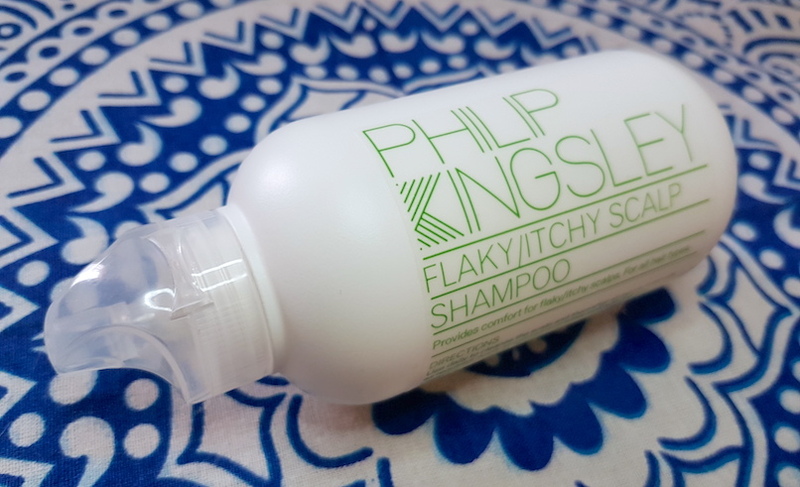 Chances are that you have probably heard of Philip Kingsley products already. After all, the company is famous for products such as the Elasticizer, and if you're a beauty box fan then you're likely to have received at least one sample of their products at least once. Therefore, it was a natural option to find myself putting my trust in the hands of the renown haircare company led by the "world's leading expert on hair and scalp care" to try to solve my problem as soon as I discovered that the Flaky/Itchy Scalp Shampoo is free of the majority of ingredients I usually avoid (it is free of SLS and silicones, but does contain fragrance. Full ingredients list further on in the post). It is a mild formula that promises to clarify and gently cleanse the hair and scalp of flakes and irritation. It is a multi-award winning formula and it doesn't dry out the hair or strip colour. It comes packaged in a sleek, fat white bottle with a curved flip cap lid. It comes in a range of sizes which makes it great for travelling, salons or if you just prefer buying a massive bottle of shampoo over smaller ones all of the time. The shampoo itself is like a clear gel, no colours added. There are two loves in the lipstick world right now: matte lipstick and liquid lipstick. Today, I have a mixture of both to show you. Matte liquid lipstick and liquid lip lacquer with a shine finish. Yep, that's right. Enter Avon's new mark. 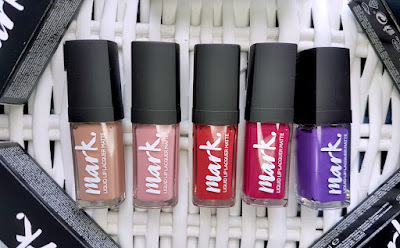 Liquid Lip Lacquer's that come in both a matte and a shine finish. The shades are pretty much the same on both sides (with a couple of exceptions), just different finishes. There are 12 matte shades and 12 shine, bringing us to 24 in total. The matte shades promise to leave a velvet finish and the shine shades a moisturising vinyl finish, but both of them claim to be long-wearing and to never bleed or feather. Sadly I wasn't able to get my hands on every single shade this time, but I have got the majority of the matte shades. Each of the lipsticks come packaged in a small, transparent, rectangle plastic tube with a wand applicator hidden in the screw cap lid. The applicator is diamond shape that claims to provide full and precise coverage in one sweep. So let's jump on in and check out the shades that I have to show you today, and there is info on how to get hold of them at the end. Hi guys! I just wanted to start off by apologising for my absence over the last couple of weeks or so. I had some really huge things that I had to deal with, and I just wanted to thank you all for your patience. We’re getting back on track here now though, so I’ll jump straight into the post. I've written in depth about essential oils in the past and even posted some DIY Beauty posts that use them, but today I’m going to be showing you a range of oils from a brand called Sacred Soul Holistics. 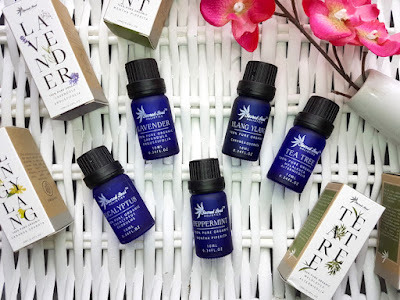 They’re a brand with an interesting story, which I’ll get to in a moment, and today I have one of each of the essential oils that they have available: Tea Tree, Lavender, Ylang-Ylang, Eucalyptus and Peppermint. Each of their oils are certified organic and 100% pure. They are steam extracted and contain no extra chemicals like silicones or parabens. For an oil to be truly effective, they need to be pure, so this is an important thing to keep in mind when purchasing oils and these ones tick the boxes. From the get go, one of the things I love about Sacred Soul Holistics is their no nonsense, truth telling attitude. On their About Us page you won't be finding any claims to be this or that, but instead you fill find an honest account of how the company came to be: two life-long friends who somehow ended up with a passion for natural living. They took this passion and turned it into a business selling essential oils. No years of experience or fancy job titles to boot, just a passion for the products they sell. And that's great. From this passion came lots of research and introducing natural remedies to friends and family. I know this is something myself and I'm sure lots of you reading this article have done too. From their research they discovered what I'm sure many of us have encountered; sometimes oils work for one person, but not for another. What they continued to discover, however, was that some oils available on the market are actually full of chemicals, and this is a possible reason for why they don't work. As consumers, this didn't make them happy. This is why they set up Sacred Soul Holistics, for others with an interest in natural remedies to have access to oils that have more chance of success by being pure. No chemical filler, just like the lack of boasting filler on their About Us page. Don't think that this means that there aren't any experts involved though. Scott and Kristan made sure to seek out expert advice too, and through the combined effort they have created the range that include the five oils that I have to show you all today (the rest of their range is made up of Ear Candles). So as I mentioned above, today I’m going to be showing you their range of oils. So let’s check them out.